Needed to install onto upper unless you have an outside threaded barrel nut already. We offer a variety of custom finishes including color options as well as an epoxy grit surface. In most cases, we will color and grit for the one upgrade charge. The CACFL is a long (15") handguard designed as a lightweight handguard and can be ordered with or without the barrel nut. The threaded assembly attaches to the outer threads of the barrel nut. The tube is easily removed for cleaning and adjustments making this modular system one of the simplest while maintaining excellent strength and rigidity. Lightweight, strong and cool, even in rapid fire, this hand guard brings your rifle into the current era of advanced materials. 8.5 ounces total with a barrel nut. Customized CF tubes can not be returned if they were produced as ordered! This includes drilling, colors and grit application. We do offer custom lengths. Contact sales@carbonarms.us for custom options not available on the website. We often get asked why we do not "slot" our hand guards. Well, the answer is as simple as it is complex. Most of the CF handguards on the market are copies of our Generation 1 hand guard which we spent a lot of time researching, designing and testing. We learned during that process that the slots don't provide any significant heat reduction at the barrel. In addition, the slots significantly reduce the strength of the carbon fiber material which results in significant flexure. Last, and most important, unfinished edges of Carbon Fiber will result in eventual splintering and delamination posing a risk to the shooter. Perfect super lightweight handguard, if you are looking for a super lightweight AR build this is the one you want. Strong, easy to install and remove. I am a professional 3 Gun shooter and have used many handguards in my career. The Carbon Arms "Carbon Feather Handguard" is one of the best that I have had the opportunity to use. Super easy installation, great looking, super strong, lightweight and sized perfectly for a great hold and aids with fast and accurate transitions! Simply a awesome product!!! 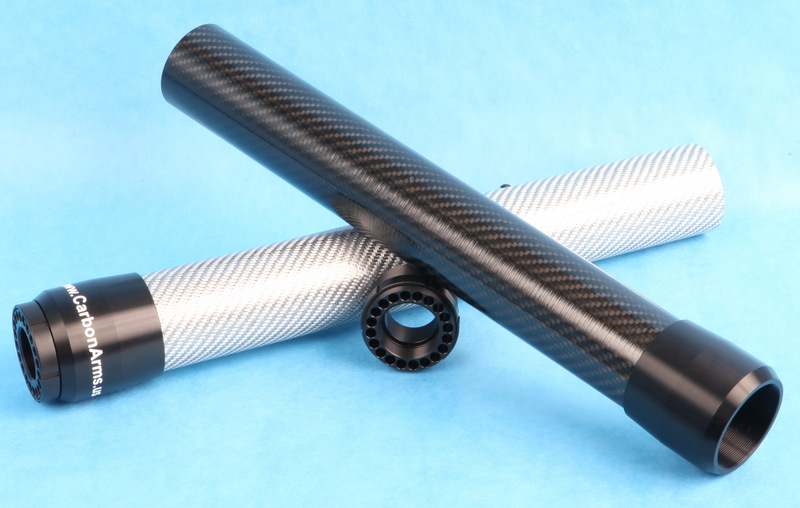 I purchased a Carbon Arms upper with the new Feather Handguard and heat shielding inside. It stays cool, is easy to remove, and is super light. I would recommend this for any application. Great product!! !